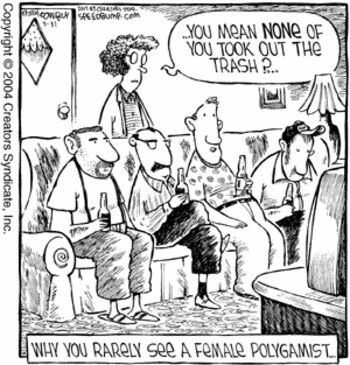 Since I’m a bit old-fashioned, I think polygamy is rather weird. And it would also be a practical nightmare. Thinking about it from a guy’s perspective, imagine having to remember multiple birthdays and anniversaries? Not to mention dealing with a more complicated approval process if you want to get permission to join another softball league or take an out-of-town trip! To be fair, polygamy could also mean one wife and multiple husbands, but what woman would want to subject herself to that burden?!? She wouldn’t even know who to blame if she found the toilet seat in the up position. But let’s look at the issue from a more serious perspective, especially because of the Supreme Court’s recent decision on gay marriage. In a column for Politico, Fredrik deBoer argues that polygamists should also be allowed to marry.